My goal was to eventually be able to begin reading or working on something from one device, and if I needed to switch to the other, not only would the user experience be similar, but the content as well. I opted to keep a few icons on the home screen/desktop of the devices. I used this wallpaper from The Paper Wall, which was featured on a Lifehacker Wallpaper Wednesday previously. On my phone, I rotated it and zoomed in a bit. 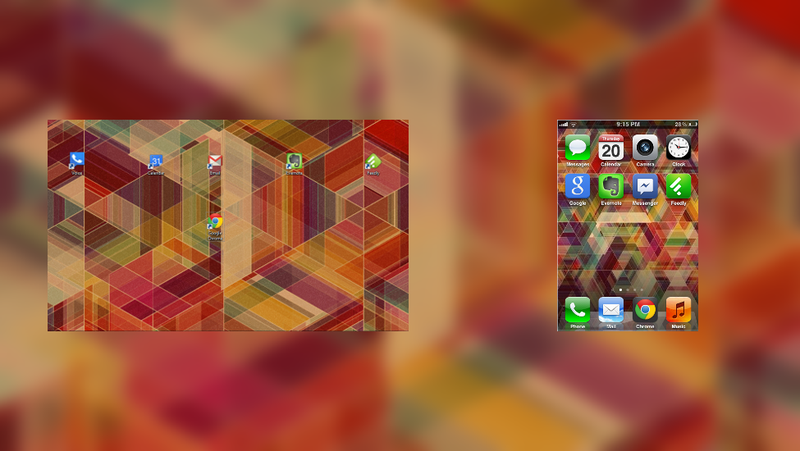 I didn't go for an exact match on both devices; I was focusing more on the overall pattern and colors. I'm a user of Google Voice, so my texts on my phone (through the Messages app) are routed through Google Voice, which I can access through the web interface on my computer. I created an Application Shortcut from Chrome on my computer and put it on my desktop. The Google Voice Chrome Extension also notifies me of a new text or missed call when I'm on the computer. This way, no matter which device I'm on, I can send and view texts from a single (Google Voice) number. downloaded the Google Calendar Web App from the Chrome Web Store and created an application shortcut on the desktop. If Google Calendar is open on my computer, I will get notifications of upcoming events there as well. shortcut on the desktop. I set up Gmail with the native Mail app on my phone as well (IMAP), and the mail is synced between the web and my phone. I've been using Evernote as my main note-taker, particularly after the rolling out of the Alert feature (which I wrote a post on). It can do a variety of things, from creating simple text notes to saving PDF documents for later reference (and often scanning their text too for quick searching). This way, my notes aren't tied to any one specific device; I can access them from any computer on the Web as well. I've recently started using Feedly as my RSS Reader. I have an application shortcut to their Cloud Reader on my desktop, and the app on my phone. Articles I've read on my phone are marked as read on the cloud reader, and vice-versa. This makes it easy to avoid reading or sorting the same articles multiple times. these devices, so I can view the tabs currently open on the computer from my phone, and vice-versa. The Omnibar also performs similarly on both platforms, filling in websites I've been to before when I've typed the first character in. My goal in this experiment was to create as similar as a user experience between a computer and a laptop as possible, particularly functionally speaking. I wanted to make it as easy as possible to transition from one to the other and have the content sync. Thanks for reading, and I'm curious: what tips or apps do you guys use between platforms?